I didn't do so hot on my November goals, only managing to accomplish one kind of. The kind of is because I did start to organize and declutter a bit (see blog post here), but I did zero Christmas shopping (although I already know what I'm getting everyone, I'm just getting up the stamina to actually go out and get it!) and don't even talk to me about healthy routines right now. 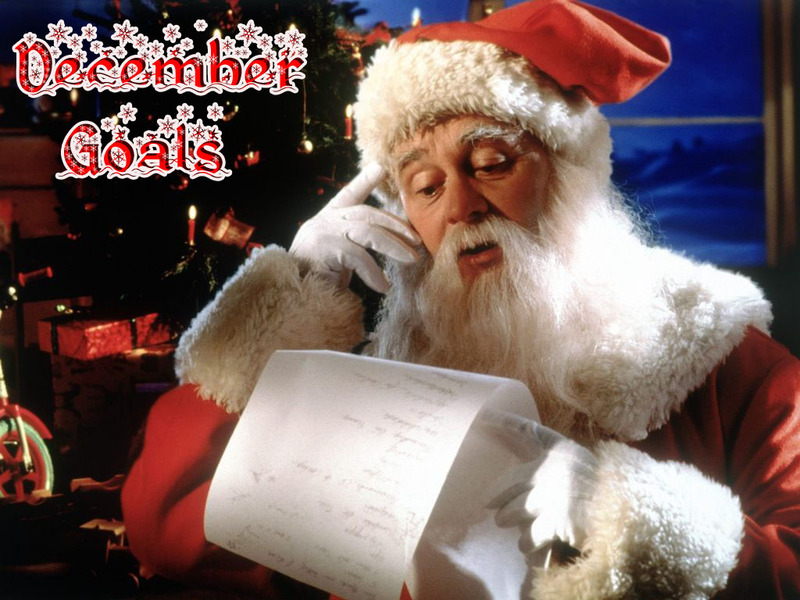 That being said, December is a new month and I'm forging ahead with some new goals. 1 - There's something I'm working on right now that's majorly time consuming (I'll talk more about that later) but I'm hoping to finish that up this week so I can have the rest of my month to relax. So this week will be crazy hectic but hopefully I push forward and get things done. 2 - Continue cooking dinner. So far this month I've made dinner every night, which is quite a feat for me as usually some time halfway through the week I throw in the towel and exhaustion takes over and we eat out. I haven't been doing any fancy meals or anything, but they've been home cooked and I want to continue that throughout the month. 3 - Clean out my wardrobe. To continue on from a theme last month, I really, really need to get things decluttered and I have so many things in my closet not in use so I either need to box some of it up or (more likely) donate a lot of it. It's a huge task but I need to take a Sunday, make a pot of coffee and just get to it. We'll see how it goes. That's awesome that you've been cooking every night, Kim! I love to cook but when I'm tired take out or going to a restaurant can be so tempting! Great goals. Eating out can be so much easier but sometimes there is nothing better than a home cooked meal. Even if it's a simple one. Can't wait to find out what you're working on girl!! Yay to home cookin'!! Happy Wenesday gorgeous!! If it makes you feel better, I've not done my Christmas shopping either ! I really need to do it! It's really hard finding the time to go out and get everything sorted :) It's brilliant that you're cooking dinner every night ! Good luck with all of your goals my gorgeous friend, I recently tidied my wardrobe and it made me feel so much better!I hope you are well beautiful lady!